The Wheel of Fortune is one of the most highly symbolic cards in the deck, filled with signs that each have its own meaning. 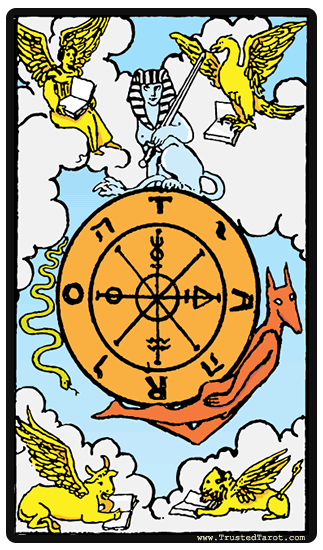 At the center of the card, lies a giant wheel, covered in esoteric symbols. There are different creatures that surround the wheel; the angel, the eagle, the bull and the lion. They are related to four fixed signs in the zodiac - leo, taurus, scorpio and aquarius. These four animals are also representatives for the four evangelists in Christian traditions, which is perhaps the reason that they are all adorned with wings. The books that each of the creatures hold represents the Torah which communicates wisdom and self-understanding. The snake indicates the act of descending into material world. On the wheel itself, rides a sphinx that sits at the top, and what appears to be either a devil, or Anubis himself arising at the bottom. These two Egyptian figures are representative of both the wisdom of the gods and kings (in the case of the sphinx) and the underworld (Anubis). They are rotating forever, in a cycle, and suggests that as one comes up, the other goes down. The Wheel of Fortune turns evermore, seemingly to communicate that life is made up of both good and bad times, and that the cycle is one that we cannot control. It is something that is subjected to both kings and workers, and that nobody on earth can avoid what is fated. When you have good moments in your life, make sure that you enjoy to the fullest, for what comes up must always go down. The same is true in reverse - when you are in a bad situation, things will eventually become better again. The same forces that govern the changing of the seasons, or the rising and setting of the sun is also the master of luck and the fate of individuals. Greater forces that are outside of human control are at work here. The same forces that govern the changing of the seasons, or the rising and setting of the sun is also the master of luck and the fate of individuals. Where it lands is as random as chance - you may find yourself at either the top or bottom, but remember that no matter what the outcome it may not last for very long, for the wheel always turns. When the wheel is reversed, it means that luck has not been on your side and misfortunes have been following you. When it's associated with this card, you must understand that these are due to external influences that you cannot control. Like the wheel, our luck and our fate is always in motion, and sometimes we are on the bottom. Be assured that the wheel will turn again, and you will be okay again soon. What you shouldn't do however, is cling to the illusion of control. Perhaps in this turn of the wheel, the lesson is to learn to let go and release. There are things that cannot be moved by human will and action alone. When we do not let go, it can bring only more suffering, for you may blame yourself for actions that could not have altered the situation. When we learn to accept, we also learn to forgive ourselves. We learn to move on, and move forward - and eventually, we learn that this feeling of acceptance can push the wheel again forward, and move it towards a new cycle.